A Short History of Bloxwich Libraries | The Bloxwich Telegraph – incorporating The Bloxidge Tallygraph and Walsall North News. Founded 2006. Bloxwich Library is a very popular facility for the local community, and deservedly so, thanks to its dedicated and highly professional staff and management. Both the library and the associated Bloxwich Library Theatre are essential cultural resources for the town, and have had a positive impact for many years, as I know only too well – I have been a library member since childhood! But did you know that in fact Bloxwich Library has occupied four different sites during its history, and has been providing a vitally important service to local people since the mid 19th century? The “Old Library and Police Station” (of 1874) was in Harrison Street, in a house later occupied by Mr. Jabez Wootton and subsequently used as a club by the Bloxwich Branch of the British Legion. Today, this is the old part of the Bloxwich Memorial Club. The new and typically Victorian Bloxwich Public Buildings were built in 1882-4, and were located in Elmore Green Road, on the site to the right of Bloxwich Hall now occupied by the relatively new and much larger Bloxwich Police Station (the old Public Buildings were demolished in 1999, and eventually the new police station was formally opened by Princess Anne, the Princess Royal, on 26th September 2002). By 1904, it is recorded that within the Public Buildings there was still a Library and a Police Station, the latter staffed by Edward Marshall, the inspector, two sergeants, and eight constables. In 1912, the number of readers frequenting the Bloxwich Public Library on Sundays averaged 100 and the total number of books issued during the year was 6,332. The Reading Room was open daily from 9am-10pm and on Sunday from 2pm-9pm, but the Lending Library was open only on Wednesdays from 3pm-7.30pm. Rather different to modern day library opening hours! After the Great War, a war memorial was built, and unveiled on Sunday 5 November 1922, not far from the Public Buildings, on the corner of High Street and Elmore Green Road, where it stands today. The War Memorial was paid for out of the local After War Fund, and the names of those who had died were inscribed on scrolls which were placed in the church of All Saints and in Bloxwich Library. 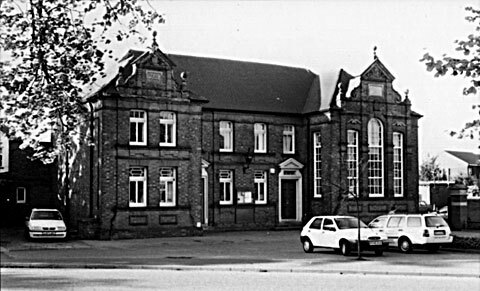 The third Bloxwich Library, located on The Pinfold at the corner with Field Road, was opened on Tuesday 14 September 1948 by the Mayor, Councillor F. W. Evans, and immediately after the ceremony members of the public were admitted for registration. The lending service commenced the next day, and from then on the library opened daily from 10am – 7pm except for Wednesday, when it closed at 1pm. These ‘new’ library premises comprised two huts which had been a local Ambulance Station during the Second World War. As the first full-time lending branch library in Walsall, it had been admirably adapted for the purpose, and stocked with 5,000 new volumes to provide a wide variety of reading in juvenile, fiction, travel, biography and other sections. 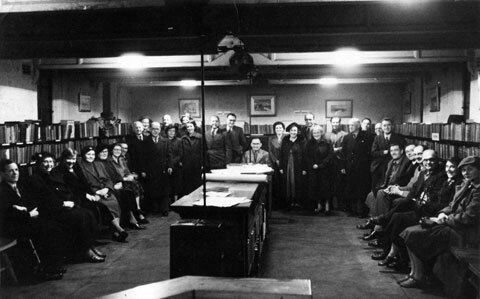 Finally, Homeshaw records that “At Bloxwich for the last three years lectures and discussions have been organised by the Extra-Mural Department of Birmingham University at the Library and at the Excelsior Works. The numbers attending have considerably exceeded similar lectures held for the rest of Walsall in the Technical College. Plans are on foot to hold a series of lectures also at Dudley’s Fields.” The 1948 library was successful for many years, but eventually the ‘temporary’ building came to the end of its useful life, and plans began to be laid for an exciting new library for Bloxwich. The present Bloxwich Library in June 1962, before the Library Theatre was added (WLHC). The present Bloxwich Library, which replaced the 1948 buildings, is located in Elmore Row. Plans had begun to be drawn up for a new library as early as December 1954, but it was not until the end of January 1959 that the imminent start of building work was announced by Walsall’s Borough Librarian Mr. R. H. Malbon. 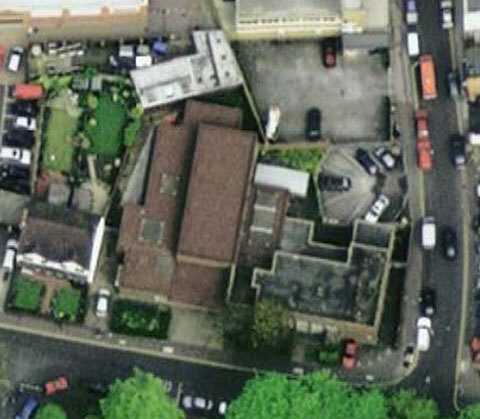 The new branch, which was to cost £21,000, would be built on part of the former site of The Blue Pig, a home-brew alehouse which had been there from at least 1834 until closing in March 1931 (the two houses to the left of the library are also on the Blue Pig site). The old library on the Pinfold closed at 7pm on Tuesday 27 September 1960. 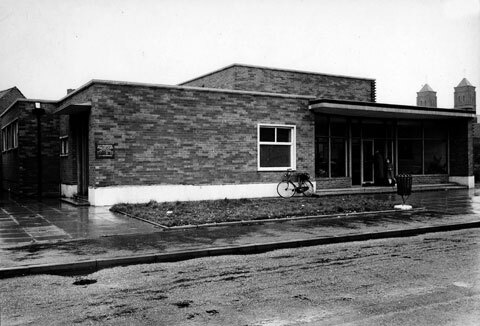 The bright, brand new Bloxwich Library was opened on the evening of 29 September 1960 by Councillor Miss E.M. Flint, chairman of the Free Library and Art Gallery Committee, who explained “In choosing the colour scheme and furniture we have tried to get as far away as possible from the old-style institutional atmosphere. The chairs are comfortable, the tables attractive, and the colour scheme is relaxing.” This Bloxwich Library was the epitome of the modern branch library of the 1960s, bright, airy, comfortable, accessible and informal, laid out in the open plan style. It even had a fish tank set in one wall! After the opening ceremony, the first three books were issued by Mr. R. H. Malbon to the mayoress Mrs. A .V, Fletcher, the deputy mayor Councillor Mrs. Dora Middleton and Councillor Miss. E. M. Flint. The new library included a special department for children, where mothers could come and sit in comfortable armchairs and read to younger members, or take the books out in the usual way. Also there was a section for teenagers, containing books written to appeal especially to them, and of course the adult department with the usual fiction and non-fiction sections. The pride of the new branch was its reference department, with facilities for silent and serious study, including four cubicles where youngsters could study in solitude. The hope was that the young people of the district would come to make use of the department by referring to the books in connection with their G.C.E. examinations. Initially stocked with books transferred from Walsall Central Library together with stock from the old Pinfold library, it was expected that readers would soon be able to take advantage of a full and attractive stock of 20,000 new books at Bloxwich. In February 1961, just five months after the opening of the new library, a report in the Walsall Observer revealed that plans had begun to be prepared by Walsall Council’s Free Library and Art Gallery Committee for a new “lecture room and drama room” to be added to Bloxwich Library, and so what is now known as Bloxwich Library Theatre was conceived, but it was to be another three years before these plans would come to fruition. The aim would be to provide a facility for dramatic productions, public lectures and meetings, with the intention of encouraging cultural and educational activities among local people, and it was hoped that a number of societies would be born as a result of the provision of the new centre. It was intended that activities would be sponsored by the Library and Art Gallery Committee, by the Committee working with ancillary societies, and by outside public bodies. By 1964, the Committee was considering whether to make the facility available for nominal charges for the first year, to encourage local societies to use it without fear of incurring losses. Hire charges would in any case be kept as low as possible. The plan almost came to naught, however, as at one point it became necessary to hold a public enquiry by the Minister of Housing and Local Government when an objector to the scheme said that he thought that the building should be paid for by a private enterprise, and not by the public. Walsall Council’s case was that the room would be designed as an integral part of the library service. It would not be used for dances, weddings or purely social functions. In granting his sanction, the Minister said that his inspector considered that suitable accommodation of the nature proposed by the Council was desirable if small or newly-formed groups were to prosper, and that local exhibitions or lectures were likely to be more successful in the planned extension than at the Central Library two miles away. This substantial extension to the main Bloxwich Library building, built at a cost of nearly £20,000 plus £1,000 for equipment, was designed as a theatre with a stage and dressing rooms, with a raked auditorium incorporating removable seating for 130 patrons, allowing for the clearing of an open space if required. In addition the facility included a kitchen, meeting/refreshment room, projection room, cloakroom and equipment storage facilities. The centre, the first of its kind in the Midlands, was opened on 10 September 1964 by the Mayor of Walsall, Councillor Bert Smith, who acknowledged the leading part Councillor Miss E.M. Flint had played in the provision of the new building as chairman of the Library and Art Gallery Committee. After the opening an inaugural play entitled ‘Without the Prince’ by Philip King, a “Yorkshire village comedy”, was performed by the recently formed Bloxwich Dramatic Company with a guest producer, Mr. Dennis Whittaker. The advertisement for this event in the Walsall Observer lists the venue as ‘The Bloxwich Drama and Lecture Room’. On 12 November 1964 the new Bloxwich Film Society, formed to use its facilities, held an inaugural meeting in the Library Theatre at which a selection of early silent films were shown, referred to as ‘an evening with Charlie Chaplin’. By December 1964 the building had become known as Bloxwich Library Theatre, and in January 1965 the resident drama group became permanent, renamed the Bloxwich Theatre Company, with Councillor D. L. Harrison as their President. Since 1874, Bloxwich Library, whichever building it has occupied, has continued to evolve, expand and improve, thanks to generations of enthusiastic, skilled and helpful staff and managers. Together, both the library and the library theatre have become a much-loved and essential part of the lives of Bloxwich people, making culture and knowledge available to all. Of course, libraries have changed considerably in just the past 47 years; for example, desktop computers, CDs, DVDs and the Internet were the stuff of science fiction in the 1960s. Today, they not only stand side by side with the books which were once the librarian’s sole stock in trade, but serve as sophisticated management tools for the library staff and powerful reference resources for the public. Moreover, it is no longer necessary to wait for new books to turn up by train with a librarian from Walsall once a week as they did in the 1950s! Now, thanks to the hard work of Walsall Council’s Libraries and Heritage management and staff, and a well-deserved Big Lottery Community Libraries Award of £1.2 million in 2009-10, Bloxwich Library and Bloxwich Library Theatre has been rebuilt and rejuvenated as ‘Bookmark Bloxwich’, and a floutishing partnership with Bloxwich Library Forum has brought live music, theatre, entertainment and education back to the dear old Bloxwich Library Theatre. With its origins in the time-honoured traditions of the Free Libraries of the Victorian era, but fully equipped for the modern information age, this vibrant, popular and up-to-date facility surely has a bright twenty-first century future ahead of it.